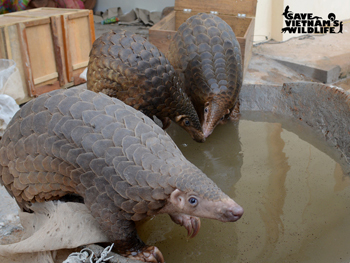 Save Vietnam’s Wildlife (SVW) is a Vietnamese non-profit organisation that was founded in 2014 but formerly operated as the Carnivore and Pangolin Conservation Programme (CPCP). By addressing the need for more effective conservation action, the organisation aims to safeguard Vietnam’s biodiversity for future generations. At the core of SVW’s work in Vietnam is a collaborative partnership with Cuc Phuong National Park, to support the management and operation of the CPCP. The programme focuses on the rescue, rehabilitation and release of carnivores and pangolins (scaly anteaters) confiscated from the illegal wildlife trade, and the development of global conservation breeding programmes for threatened carnivore and pangolin species. WWCT has supported the conservation of species such as Owston’s civet and Sunda pangolin predominantly through the staff of Newquay Zoo providing expertise and funds. WWCT has also funded a Technical Advisor at SVW to coordinate animal husbandry and international communication. Very little is known about the ecology and biology of these elusive species. SVW staff carry out scientific research to understand the requirements of threatened species in the wild and in captivity. Their work informs animal welfare standards and practices for the animals in the care of the CPCP. Wherever possible these animals are rehabilitated and released into suitable habitats, supporting the conservation of wild populations. SVW also plays an active role in the education of law enforcement officers and the public to promote positive perceptions and attitudes towards wildlife conservation in Vietnam.